October 22, 2017 PATILLAS, S.E. 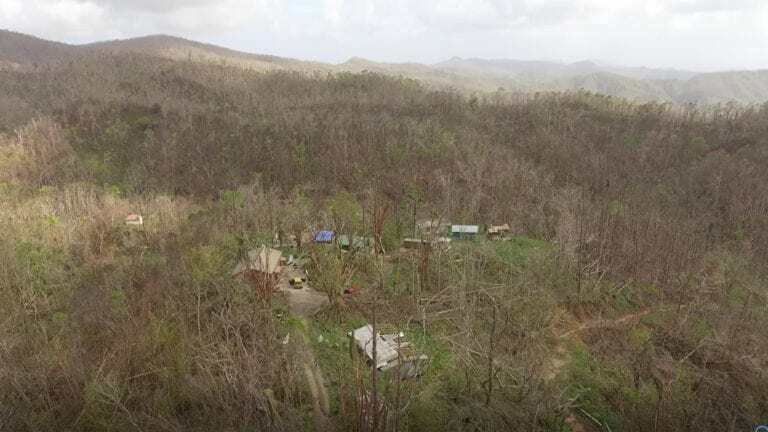 PUERTO RICO—Award Winning Sustainable Forestry Project, Heavily Damaged by Hurricane Maria, Works to Rebuild and Rescue Valuable Fallen Hardwoods. On Sept 20, 2017, the eye of Hurricane Maria passed directly over the Las Casas de la Selva, Sustainable Forestry and Rainforest Enrichment project, leaving behind devastating damage to trees, buildings and infrastructure. 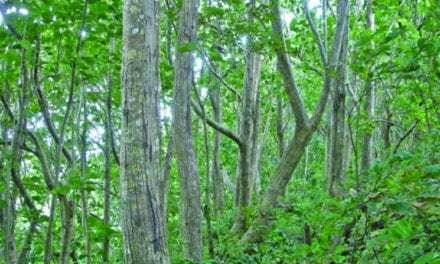 The project was recently awarded the prestigious National 2017 Energy Globe Award for Puerto Rico in recognition of its sustainable forestry program testing the efficacy of line-planting enrichment in the wet tropical forest as a means of achieving both economic return and protection of natural biological resources. 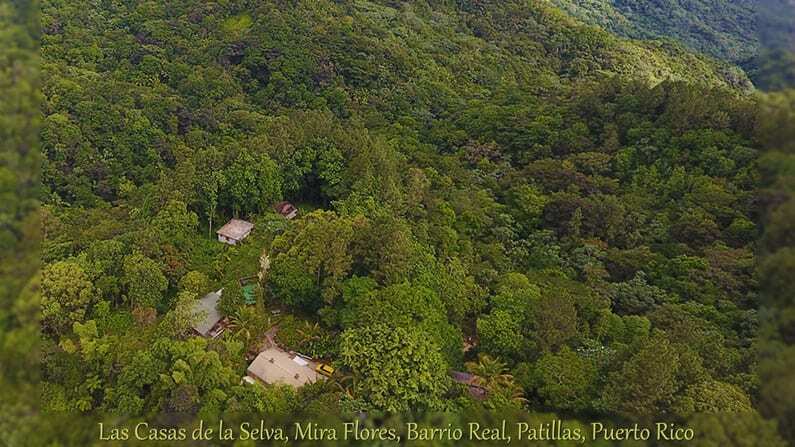 Las Casas de la Selva project was initiated in 1983 by the Institute of Ecotechnics, an international non-profit organization pioneering innovative approaches to healthy land-use in rainforest, grassland, desert, city and ocean biomes. Tropic Ventures, LLC, manages the the 1000 acre project in Puerto Rico, using a unique approach to forest enrichment in secondary rainforests called “line-planting”, where valuable tree species are planted in cleared lines or blocks, simulating forest openings when tall trees fall with minimal distrurbace of the surrounding forest, offering critical soil erosion protection, preserving biodiversity, and facilitating forest development. Two weeks after the hurricane. 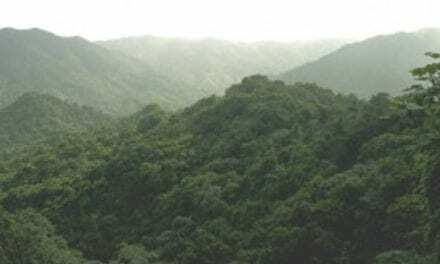 The project has helped catalyze Puerto Rico’s governmental, university and popular appreciation of the value of their native forests. Puerto Rico was just awakening to the potential of sustainable use of their forestry resources when Hurricane Maria hit. Now, in Maria’s wake we find devastation to so much of the forests. Las Casas de Las Selva project directors are seeking to work with the relief agencies to help recover valuable timber resources that are currently lying on the ground rather than discard them as waste. 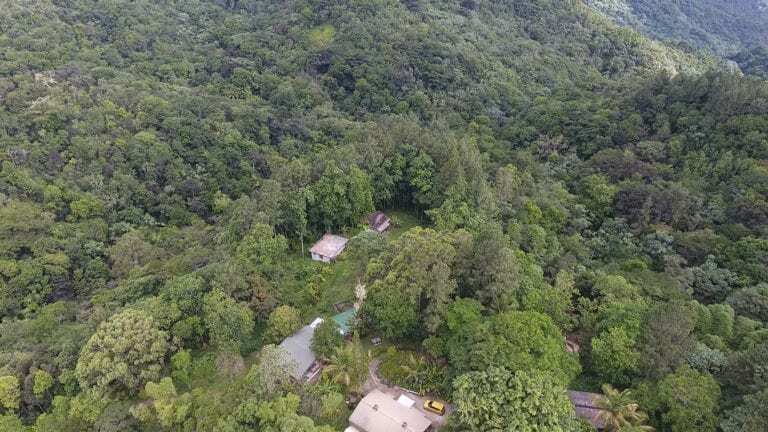 The project is working with their commercial timber processing partner, Puerto Rico Hardwoods, to recover the resources for reuse instead of adding to huge landfill costs. 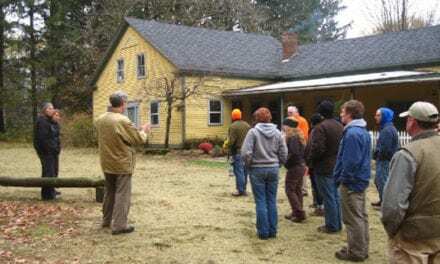 Timber on the island has largely been an under-utilized natural resource, and now could be an industry and also vital material for the rebuilding of so many destroyed buildings. Thrity Vakil, the Institute’s Sustainable Forestry Director, based for the last two decades at the project, was able to leave the island two weeks after the hurricane, at the Institute’s headquarters in Santa Fe, New Mexico, organizing emergency relief efforts for the project and surrounding community, and raising funds for the clean-up and rebuilding of the project facilities. Same homestead area after Maria. Wood shop (large building in foreground) survived, the spine of the roof torn off. Technical director Andrés Rúa remained on the ground at the project, with sufficient food and water, and generator power, but limited communications and fuel supplies. 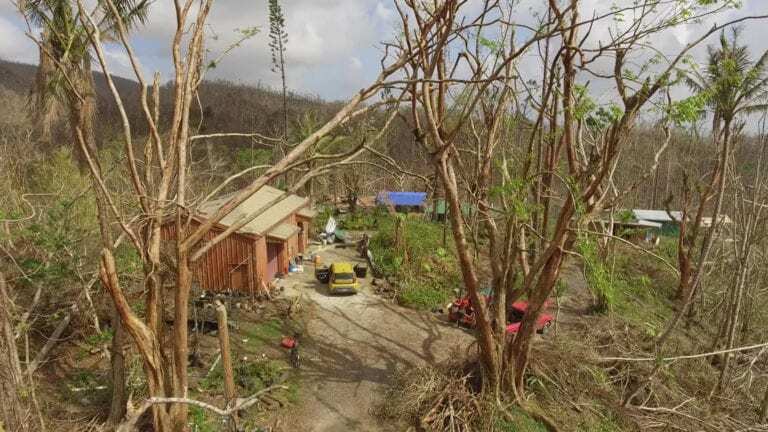 A team of two ecotechnic associates flew from London into San Juan to join Andrés in the clearing and immediate repair of roofs, plumbing, and power needs. We are very grateful to the many friends and colleagues around the world sending both moral and financial support to help with the rebuild efforts. The homestead plantations suffered devastating damage, and the extent of the damage to the plantations of over 40,000 trees located at a lower elevations to the homestead, is not yet known due to hazardous conditions. The immediate focus is on human health, homestead building, and infrastructure restoration. Project directors are working with the local emergency relief efforts providing support to the clearing of roads in the Patillas region. The Institute of Ecotechnics is supporting the assessment and rebuild efforts to get this landmark demonstration project in sustainable forestry technics back on its feet; this is an opportunity to apply ecotechnic thinking to include robust hurricane proof architecture, renewable energy, and innovative land restoration techniques. Previous“The Evolution of Food Crops in the Mediterranean”.